After reading one birder’s report of McGinnis Slough being nearly under water, I decided to go see for myself. It was after 11:00 when I got there, so I didn’t expect to see many land birds, but you don’t necessarily go to McGinnis for land birds anyway. Part of the flooded trail last Saturday. The parking lot wasn’t flooded, in fact there were more cars there than usual. 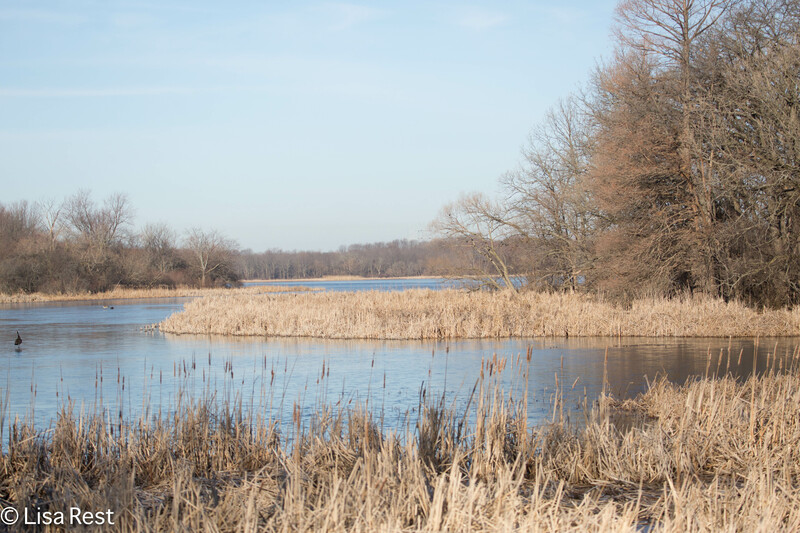 I got out of my car and started walking toward the water, and I saw the two Trumpeter Swans swimming slowly by – right in front of me. 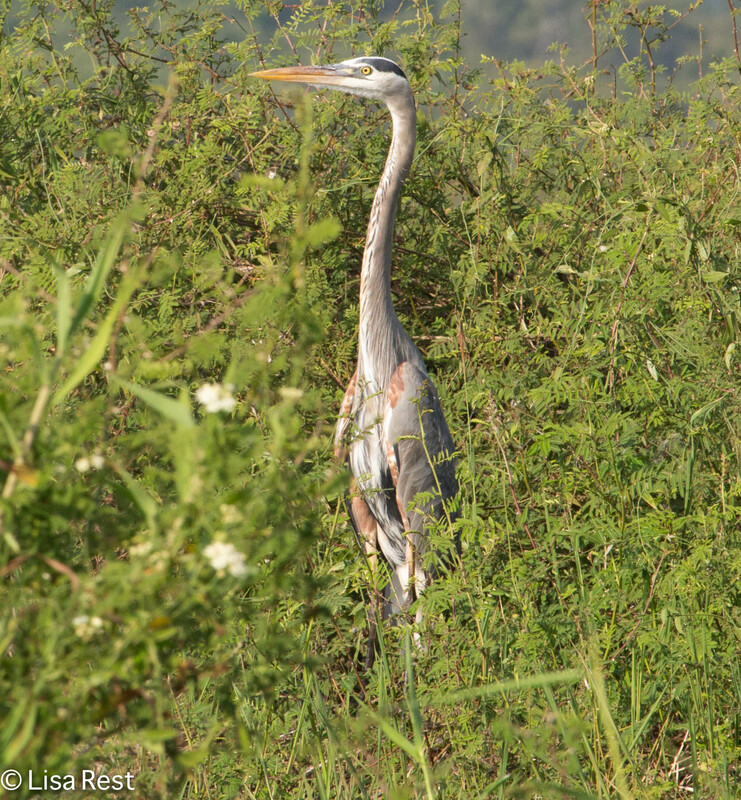 Normally these birds are way far away on the other side of the slough, visible only with binoculars if not a scope. I suppose they were checking out the other side of the pond now that the water had deepened it. No sooner did I start taking pictures of the swans than I heard a commotion from behind where I was standing. Thus began several hundred if not eventually a couple thousand Sandhill Cranes passing overhead. This was the magical part. I am invariably stuck in the office when cranes are flying over, and now I had them practically all to myself. 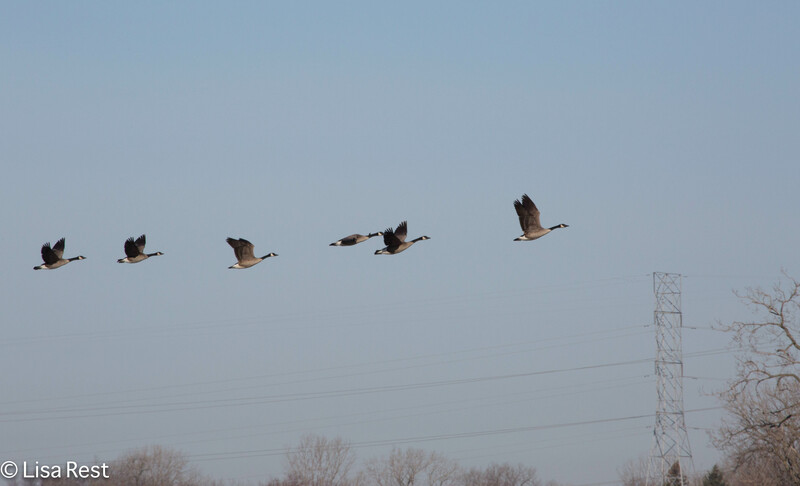 As the groups of cranes began swirling above and around each other, there were what looked like some near collisions. 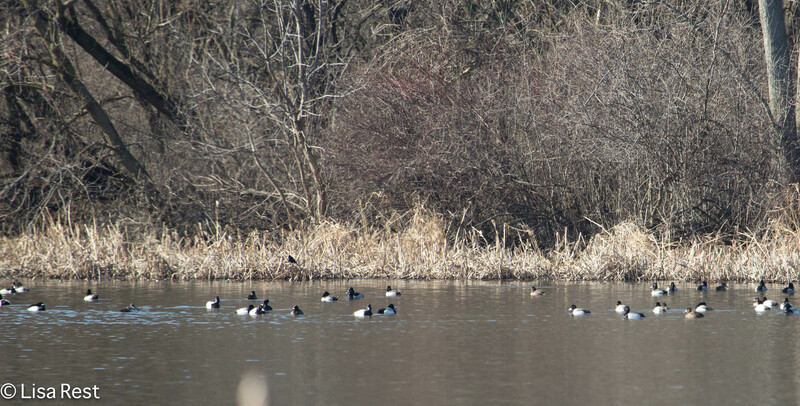 There were a few ducks close to the western edge, too, that I normally would not see. I walked as far as I could around the flooding and made it to the usual overlook where there were several young women who appeared to be part of a class outing. That explained the extra cars in the parking lot. They were absorbed in their conversation and I did not interrupt them. After my feast of birds I was not interested in trying to make out the usual dots on the water. I have to start going back to McGinnis more often. It just occurred to me that on my last visit, there was hardly any water! Any prediction of warmer temperatures and sunshine, however brief, is all it takes to make me a little nuts these days, especially if it falls on a weekend. 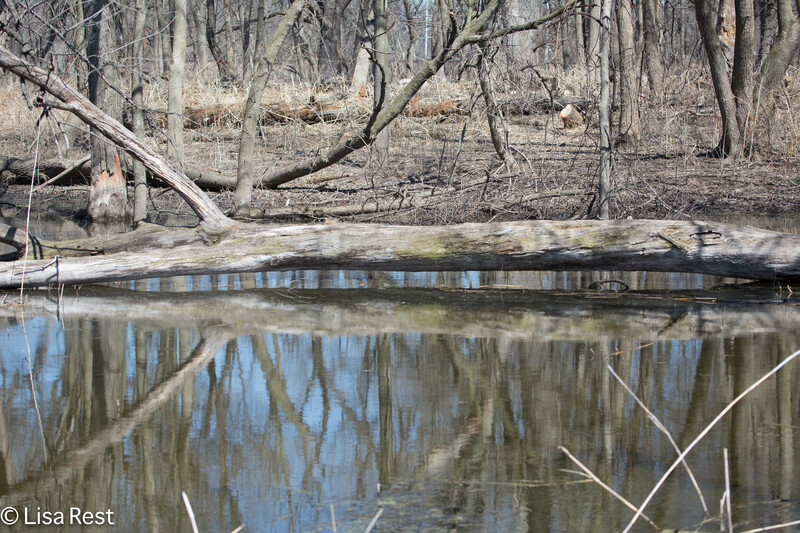 So Sunday I tested the forecast for the last days of March and headed toward the Palos Forest Preserves of Cook County, starting with my favorite, McGinnis Slough. 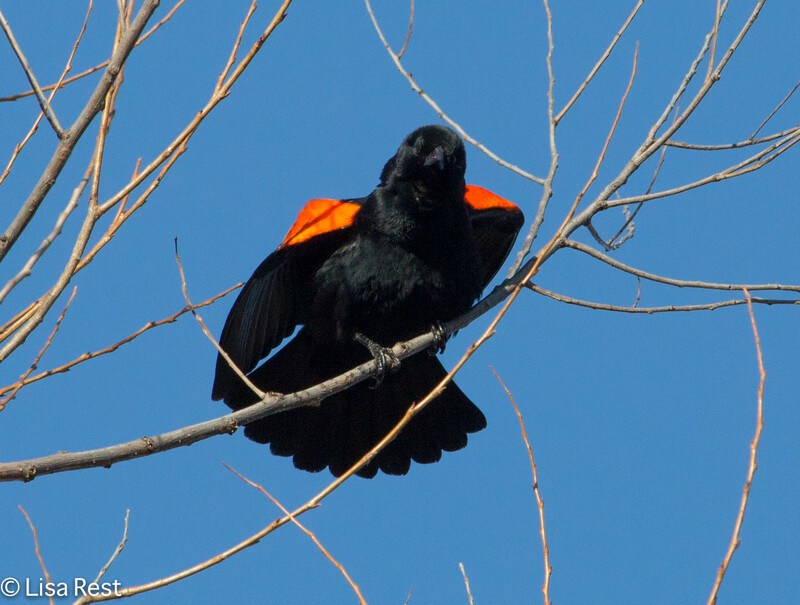 Red-Winged Blackbirds were singing on territory, but much of the water was still frozen. 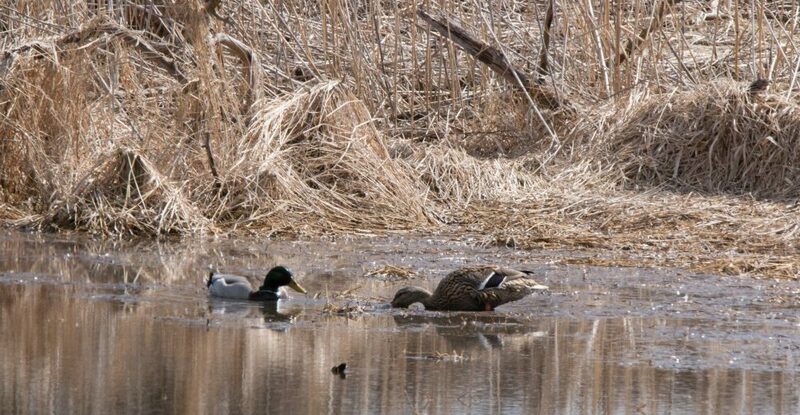 I managed to see ten species of ducks, including Ring-Necked, Lesser Scaup, Gadwall, American Black Duck, Mallard, Bufflehead, Common Merganser, Northern Shoveler, Blue-Winged Teal and Green-Winged Teal, plus American Coots and there was one Trumpeter Swan at the far side of the larger expanse of water. Even the closer ducks at McGinnis’s south end were still too far away to photograph, but that never stops me. 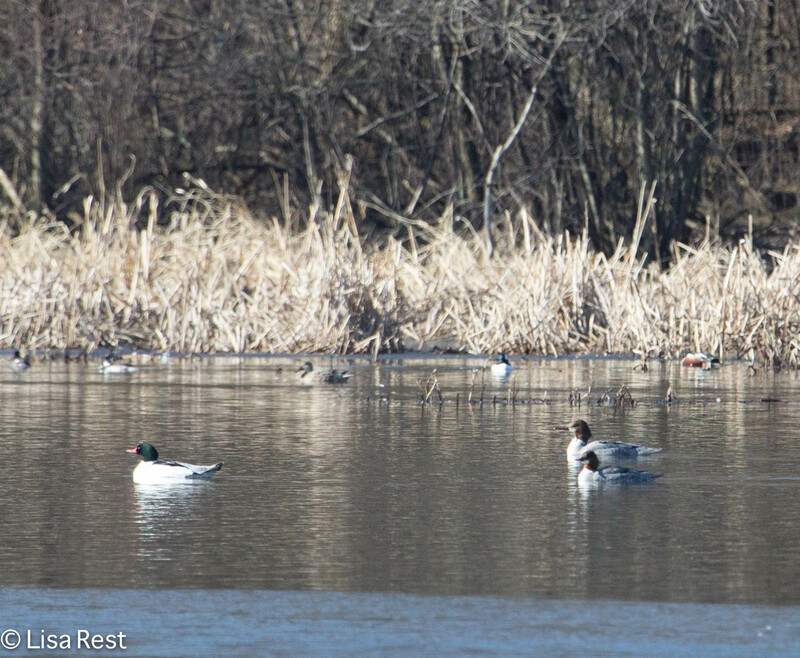 From McGinnis, I went next to Saganashkee Slough, where American White Pelicans and Common Loon had been reported. 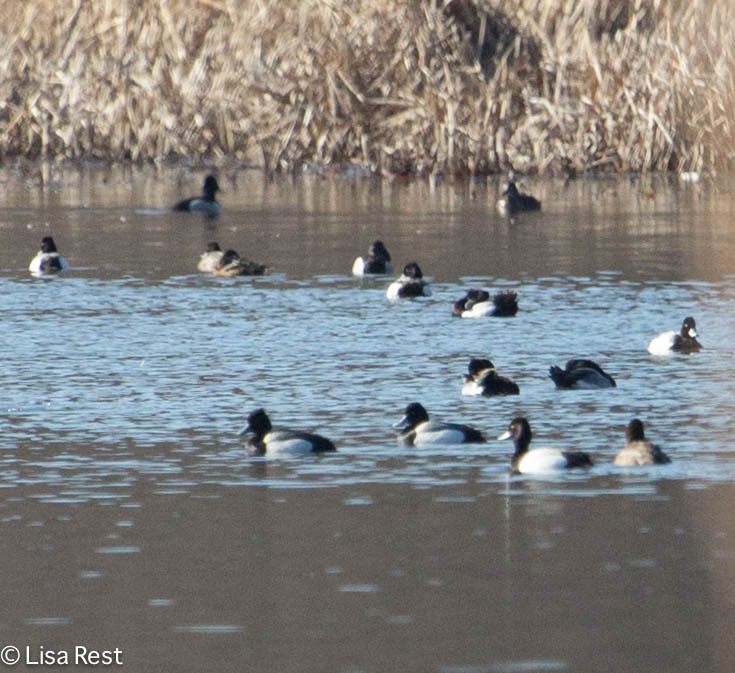 I saw neither, but added Red-Breasted Merganser, Hooded Merganser, White-Winged Scoter, Pin-Tailed Duck and Common Goldeneye to my duck list. 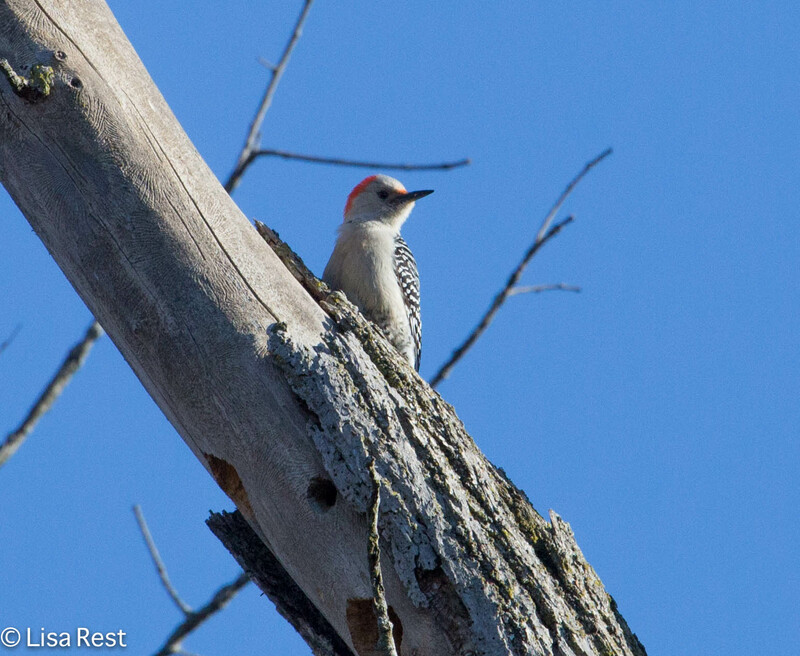 There was also a distant Horned Grebe and an immature Bald Eagle soaring over the water. It was even more useless to photograph anything here but I’m still including a picture of a lot of white blobs that were Herring and Ring-Billed Gulls. On the way home, I stopped at The Chicago Portage to see if anything new was going on since last week. 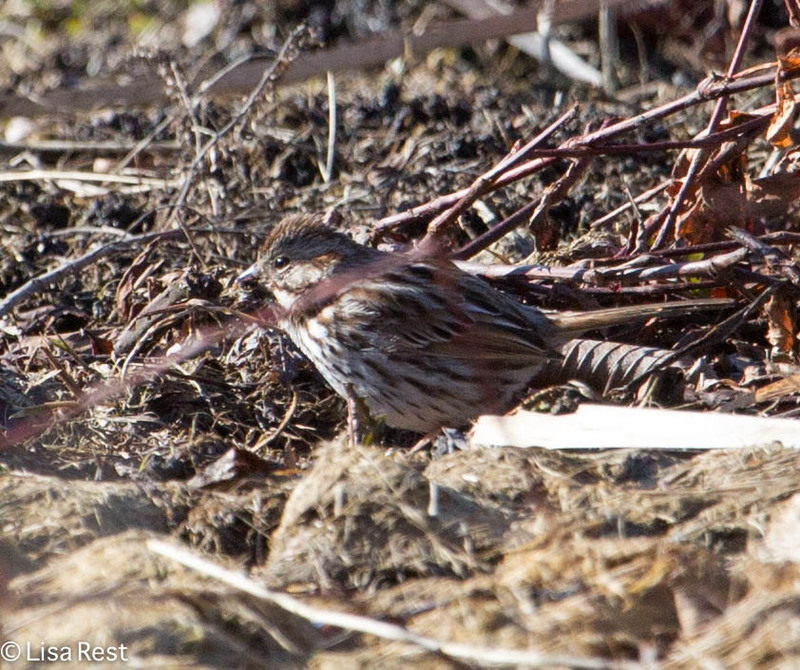 It was midday so I didn’t expect to see many birds. But there was a lot of melt and mud. 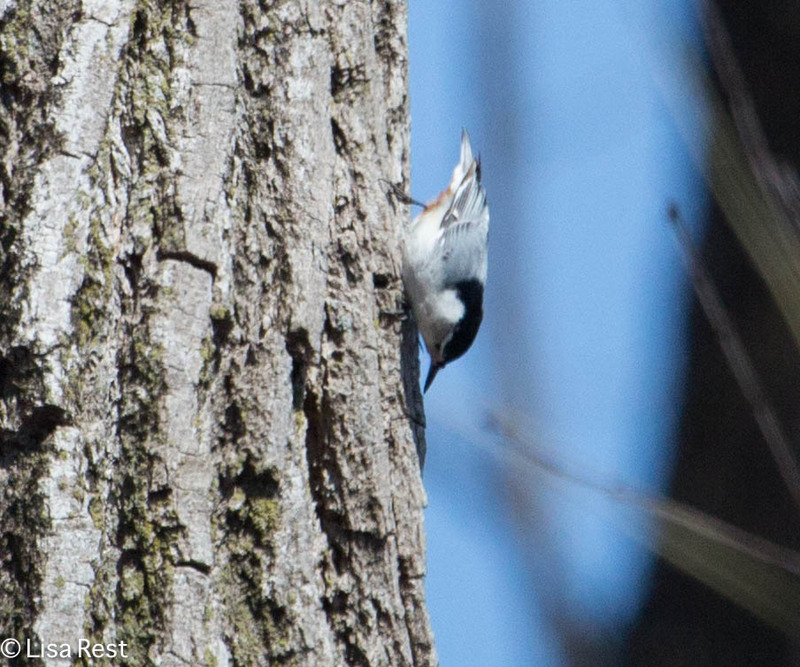 And a White-Breasted Nuthatch, heard first and seen at a distance later. 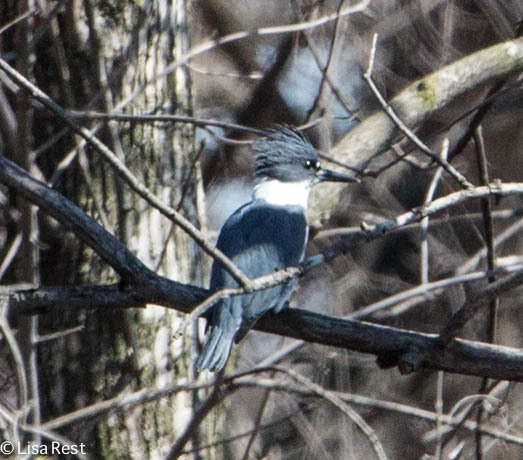 Also heard before seen, a male Belted Kingfisher. This guy was really far away but the camera saw him. I think this might be the first one I have actually seen at the Portage. 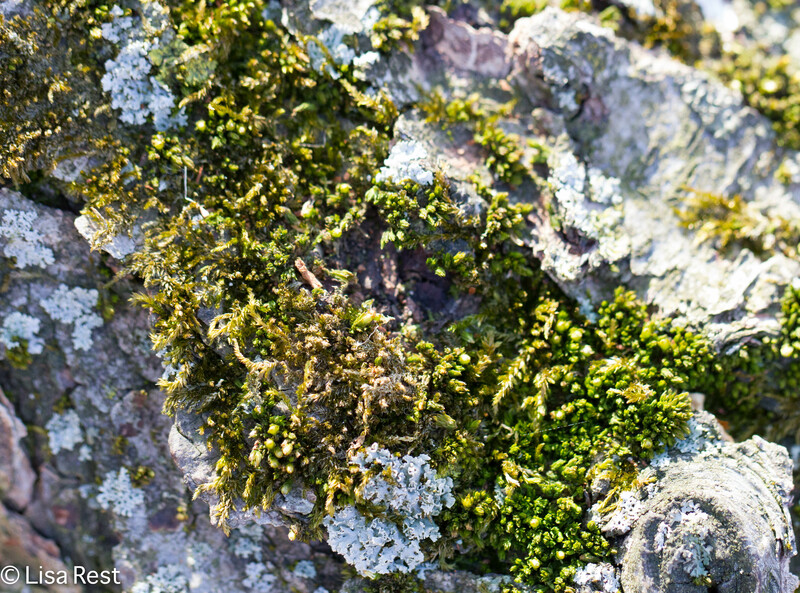 I decided to capture a close-up of some lichens growing on a dead stump, the only green going on.